Yesterday I shared some nature study from this week, which has been a slower-paced week for us. But, like I said in that post, this slower week has been a blessing because we've had time to focus on some of the things that we - okay, I - have not been very consistent about - nature journaling and handicrafts mostly. So today I thought I'd share about what we're doing for our current handicraft. What I've been considering as our "handicraft" so far has just been the girls helping me with cooking or baking every now and then. But I just didn't feel that I was doing this subject any justice. It would be different if they were actually learning to make some recipes on their own, but I don't foresee that happening for a few years. I had come across hand-stitched cards awhile ago, and it's been in the back of my mind as something that I wanted to do for one of our handicrafts. This was the perfect week to tackle it. We spent a couple of hours Monday afternoon gathering supplies from around town (Hobby Lobby and some thrift stores), prepping materials, and working on the first "project." It was so nice to just focus on this one thing, taking the time to teach it to the girls, without worrying about all the other school stuff. So I'm thinking that, in the future, it might work better to introduce a new handicraft either on an off week, or maybe on a Friday, which is an off day, or enrichment day, for us. Then, the new skill can be practiced throughout the week. Of course, this is probably what most families do, but for me this was an epiphany! The girls really enjoyed making these cards (they only made one each, but have been begging to do some more). Of course, since it was the first time doing them, I had to be right there helping them the whole time. After a while, though, Izzy just took off with it. She surprised me because she caught on very quickly, and figured out pretty much on her own how to stitch in order to make the design come out right. The link above takes you to a website with basic instructions for hand-stitching, including a list of materials. We did not use a punching awl to punch the holes in the cardstock. Instead, we used some thumb tacks that we had lying around. We also did not use a cork board. As you can see from the pictures, I just put a large coloring book on the table, facedown, and placed a folded piece of felt on top of it. That was enough to prevent the thumb tacks from causing any damage. We went to a thrift store and got about $4.00 worth of embroidery floss at 30 cents per strand. I let the girls pick out the colors. I already had a bunch of card stock that I had bought at a thrift store awhile ago for a much cheaper price than buying at Walmart or something. 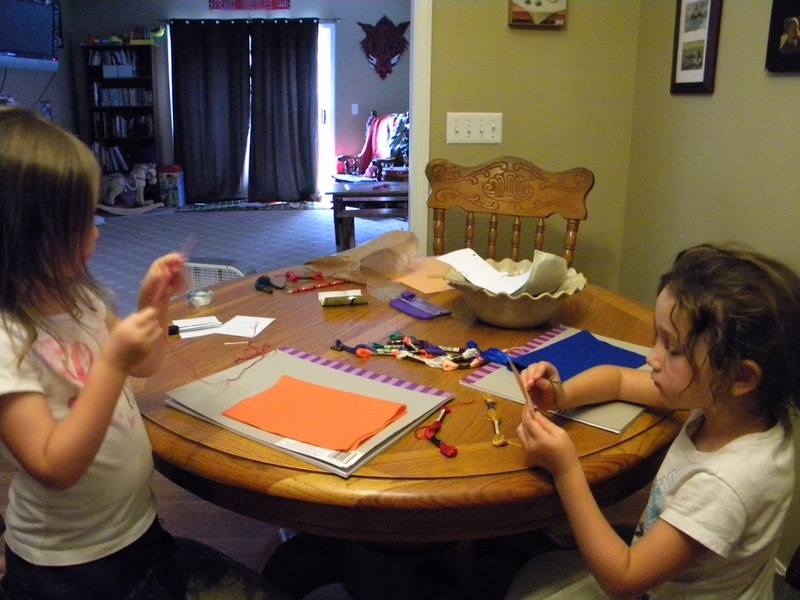 So, all-in-all, it's a pretty inexpensive handicraft, especially since we can make many, many cards with our supplies. We may (or may not) be working on things for family members, so at this time I'm not going to post any of the finished results, sorry! Izzy is 6, and this was a great handicraft for her. 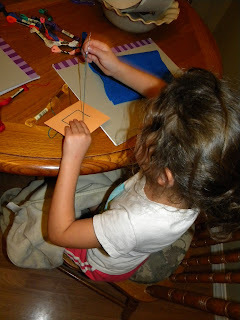 All I had to do was cut the paper and card stock to the right measurements, draw the designs, thread the needle, and poke the needle in the first hole to get her started. 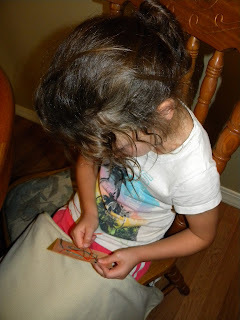 She was able to poke the holes in the card stock and stitch the design. Then I tied it off. Addy is 4, and she required more hand-holding, of course :) She was able to poke the needle through the holes and pull the string through, but I had to show her which hole each time. All I need to do now is make some more designs, cut some more card stock, and Izzy should be good to go! I'm always eager to know what handicrafts others have chosen so feel free to share! I've chosen to fix up a couple of broken children's chairs with the boys, but we haven't started yet because it is so hard to go shopping with four children in tow! I totally dropped the ball on handicrafts last year. I want to try harder to keep it on the schedule this time around. :) Do you have ideas for what other handicrafts you'll do this year? I think this age is a little more difficult to find appropriate handicrafts for. I tried showing Oldest how to knit last year, but it didn't go so well. She just didn't have the dexterity. She did embroider pretty well, though, which is a similar concept as the cards you're making. I completely agree with you on greeting cards are too expensive! You're killing 2 birds with one stone here!